"This is a very easy and tasty dish to make. The chicken is sauteed in a medley of vegetables, garlic and basil. It's then served on a bed of pasta." Cook pasta in about 4 quarts of boiling salted water until al dente. Drain. Meanwhile, heat oil in a large nonstick skillet over medium high heat until hot. Add mushrooms, onions, and garlic; saute 2 minutes. Add chicken, salt, basil, and pepper; saute 5 minutes, or until chicken is done. Add chopped tomato, and saute an additional 2 minutes. 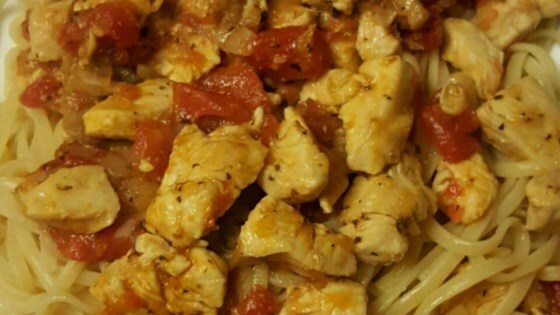 Serve chicken herb sauce over pasta. Sprinkle with Parmesan cheese. Very good, and my children (5,7,9)liked it. It satisfied my desire for a simple pasta dish as well as their desire for a rich sauce. I added fresh spinach and white wine to make more sauce. the chicken mixture was too dry to use as a sauce, but it was perfect after I added some water.